I always stress in my posts the importance of cleansing properly. A lot of people don't realise that cleansing helps the face so much - it loosens dead skin cells, gets rid of dirt that could clog your pores and harm your skin, and preps your skin so that it's ready to receive the goodness of the ingredients in your skincare. 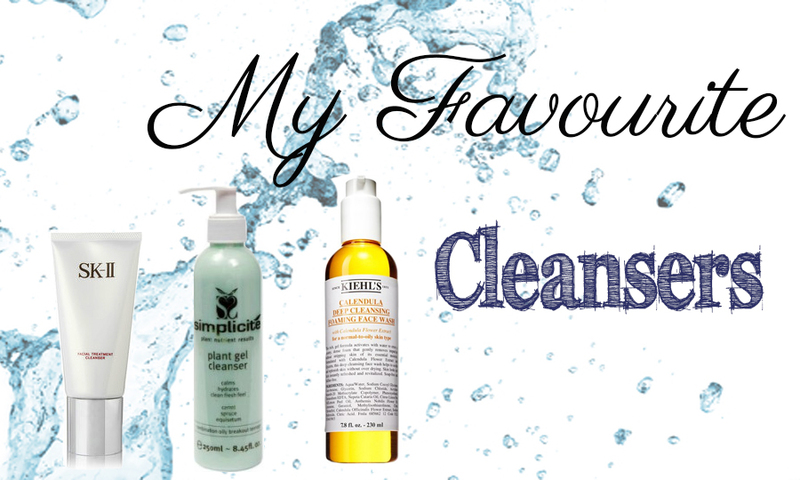 In today's post, I want to share with you some of my favourite cleansers, and why I think they do a great job. Bear in mind that I always double-cleanse - which is to say I use an oil cleanser to cleanse and remove my makeup as a first step, everyday, before I move on to these cleansers. This is a gorgeous-smelling, all-natural plant-based cream/gel hybrid cleanser, and one of the most gentle yet effective cleansers I've ever used. As with all Simplicité products, this is a multi-tasking, all rounder - it cleanses (of course! ), promotes elasticity and revitalises the skin, reduces redness and irritation, and helps reduce sun damage. I always know I'm getting my money's worth with Simplicité because their products are jam-packed with the best ingredients for the skin. This particular cleanser is their #2 cleanser, which is best suited to oily/combination skins. If you suffer from dry skin, try their #1 cleanser instead. Click on the Simplicité label below this post to see just how much I love this brand, and my experience battling pimples with their products. Available at simplicite.com.au. Following the crazy success of their Calendula toner, Kiehl's have released a Deep Cleansing Foaming Facial Wash in their Calendula range. Though it sounds harsh, this facial wash is actually reasonably gentle on the skin. This gel based cleanser quickly lathers into a rich foam once you add a bit of water, and really cleanses your skin without the use of soap and parabens. I would highly recommend alternating this with a gentler cleanser, just so you preserve the moisture in your skin whilst still making use of the pore-cleansing properties of this facial wash. Available at Kiehl's counters.